“We are on hold while we switch to Winki Pop”. Dread words for any viewer. 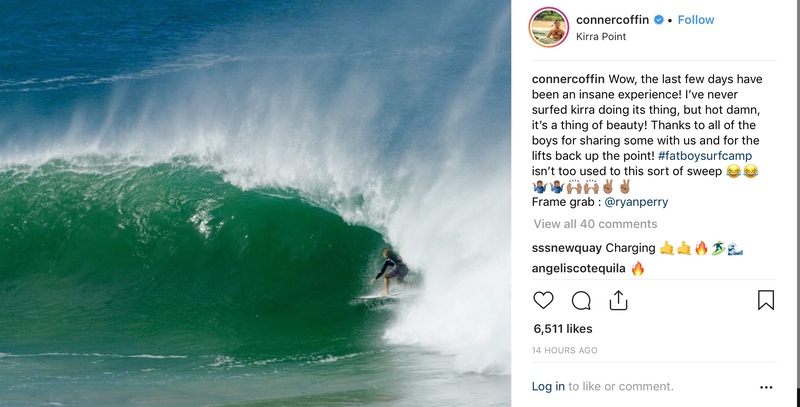 If they are there, it’s because the swell is too weak and inconsistent for Bells. And that higher camera angle makes the manoeuvres seem even smaller. Wonky Pap. True, although the commentary team's hesitancy to say shark is perhaps best judged when there’s a shark. It was a shark-shaped clump of seaweed. It was reasonable to pause and check, of course. Are front zips the banana boards of 2019? Looking at a cam, Snapper seems to be deteriorating into waist high mush. From swellnet, George Greenough on sharks reducing dolphin populations and endangering humans on the NSW Nth coast. Connor Coffin had a good time. So meteorologists, why did the swell drop in the evening at the Ox?